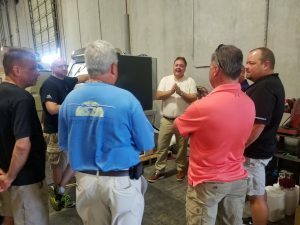 In June Aidan Mallon, the managing director of Vixen Surface Treatments, travelled to Texas to train representatives from Surface Preparation Solutions in Houston Texas. 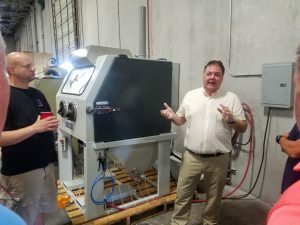 Aidan also sent out an Aquablast machine prior to his arrival to lead the show and tell, and so Surface Preparation solutions could use this as their demonstration machine. Aidan’s main goal during this visit was to educate the reps as much as possible on the wet blasting process. In the meeting, Aidan gave a demonstration on the Aquablast blast machine and presented to the team of reps all there is to know about the Aquablast range and the benefits he has learned over the years. In attendance there were 9 representatives in total, with one flying all the way from Phoenix. 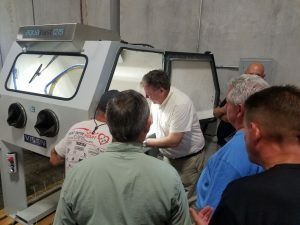 The demonstration machine was the medium sized model in the range, the Aquablast 1215, to serve as a learning tool for the representatives and to also provide demonstrations to potential customers. It is very beneficial to actually process your own parts in the Vixen machines so you can see exactly what results you will be achieving before you purchase your own machine. Educating the representatives was a very big part in aiding the growth of Vixen in the United States. Aidan explained how Vixen go above and beyond to meet the needs of customers and strive to design and manufacture the very best wet blasting cabinets on the market globally.